Global Art: Activities, Projects, and Inventions from Around the World. We’ve been using this as part of our curriculum this year. We’re currently studying Central America so I’ve been able to pick out different crafts from that region of the world. Green Crafts for Children. This one had a lot of basic ideas – lots of stuff that I’ve seen online. But it was inspiring enough for me to make pom poms with the boys and little cork animals. It’s a nice one for the kids to look through and pick an activity out of. My only complaint is that many of the crafts are aimed toward girls. Drawing With Children. While this may not be crafting necessarily, I had to mention this book. I love this approach to drawing. It’s concepts are simple enough for the kids to understand but foundational to drawing. Not being an artist myself, I’ve learned a lot using this book. So let’s get on to the latest craft the boys and I did together. It wasn’t too messy and was lots of fun. 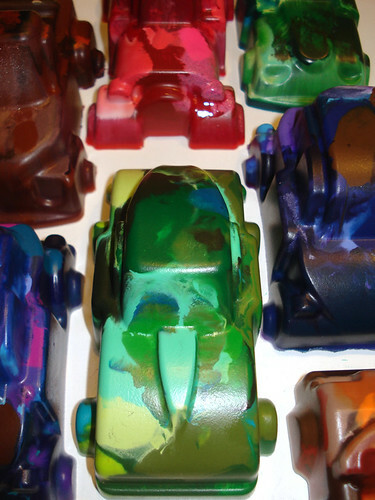 Crayon cars. 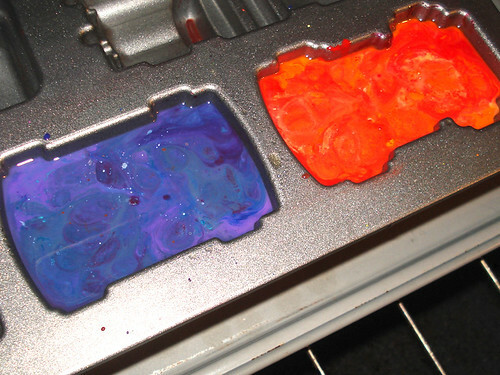 Melting crayons certainly isn’t new, but when I saw this car cake pan ($22 at Target), I had to try this. 1. Peel the paper off of the crayons. Sitting around peeling the paper off of the crayons together was fun! A great fine motor activity that we all enjoyed. My sons are pickers like me. We sorted the colors so that the final cars would be different shades of the same color. 2. Break the crayons up. Snap, snap, snap! Break the longer pieces up. The boys loved this part. 3. VERY IMPORTANT STEP: spray your car shapes with cooking spray to help the cars come out of the pan easily. 4. Preheat oven to 200 degrees. Much hotter and your house will smell like wax for a few hours. 5. 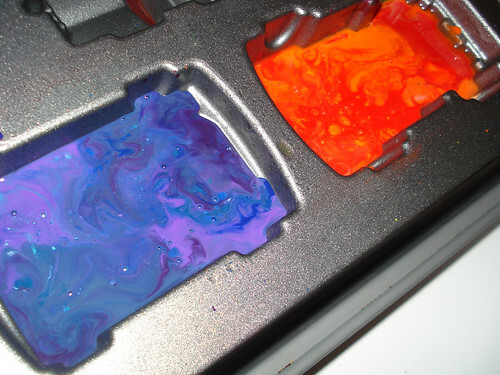 Fill the pans with crayon bits and pieces. Here they are ready to go in the oven. See how they aren’t full? 6. 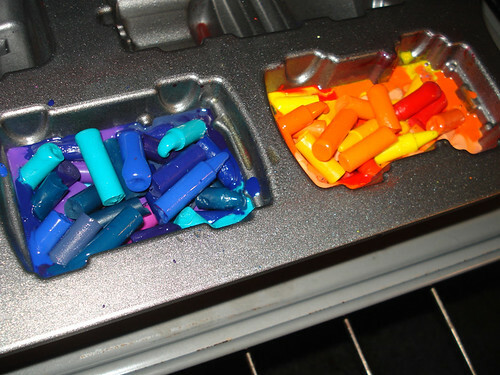 Add more crayons if necessary and put them back in the oven for another 10. 7. Remove from oven and cool. They should pull away from the edge of the pan as they cool. 8. When completely cool, the cars should come out with just a little gentle encouragement. In addition to using the crayon pieces we had around the house, I also purchased several boxes of 68 count Crayolas. 2 boxes ($5 total) made ~8 of the smaller-sized cars (we didn’t even try the bigger cars). Not the cheapest little crayon, but certainly doesn’t break the bank if you’re giving a little gift to a friend. I think we’ll be making some of these up for the boy’s buddies when we pass out Christmas cookies this year. And for the girls? 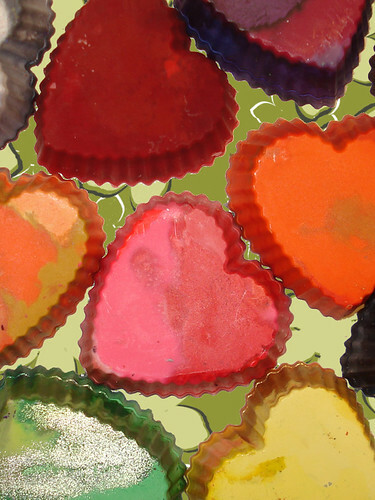 These little hearts were made using mini silicone hearts cupcake cups I purchased around Valentine’s Day. Can you still draw with them? I’m definitely going to try this with my boys. They will LOVE it! Thanks for the idea. Let’s make a whole bundt cake!! Using the car mold really makes it special. You should put some butcher paper down and let the boys”drive” around. This is a really great idea for party bags, such as for a kids birthday or classroom parties. I used to teach elementary and would use the left-over crayons to make suncatchers with the kids, but this is soooo much better. I agree with your point about many crafts being “girl focused”. I often complained about this when I was teaching. I know what you mean about the crafts. We homeschool too and things are already messy enough. When they ask if they can paint, I start to twitch. I hate that mess. But….I’m learning how to handle it. Love the crayon cars. Great gift idea. Someone recently made a car roll (you know like those fabric crayon rolls only for cars) and it had a little felt road on one side. These would be adorable in it! I wish I could remember who it was so I could post a link. If I do find it I will post it here. These would be an EXTRA cute gift in one of those! That IS the post I remember seeing. Thanks for sending the link! Wow, how cool! It never occurred to me to use one of those shaped cake pans! Those look awesome! They would make great loot bag gifts. What a wonderful, and very creative, idea!! What a great idea! Ive seen those kind of pans at garage sales and didnt know what to use them for. way to think outside the box! I LOVE those! I will have to give it a try, Josh would love the cars!!! Good for you Linda, I know what you mean about the mess. I loved the book Drawing with Children too! I’ve done this in plain old patty tins but the shapes are much better , love them ! Does it ruin the pan, or can you turn around and bake in it? I love the idea!! I wish I could find those cars.. guess I’ll have to go to Target. Those turned out great! I’ve been wanting to melt down crayons with the kids, but we just haven’t gotten around to it. Maybe I need to go get a fun shaped cake pan for inspiration. Love these cars. Your blog is great. WE won, we won, we won. We are the champions of the northern hemisphere. Us, tiny little nation. Damn it was good, and Shane, glorious Shane is now top ever try scorer.Of course I am probably officially dead as I couldn’t breath for the last 12 mins it was so tense.Just wish (and this doesn’t happen often) that I was in Cardiff tonight for the celebrations. I love the crayon cars! My boys would have loved that. I think they are too old now. lol I think I learned creativity because of the homeschooling. I always thought I wasn’t creative at all and then I had to teach the kids art. Well, it opened up a whole new world for me. Now I LOVE to be creative. Go homeschooling!!! Yeah!! I made them!! I sent a link back here for instructions. I Love it! 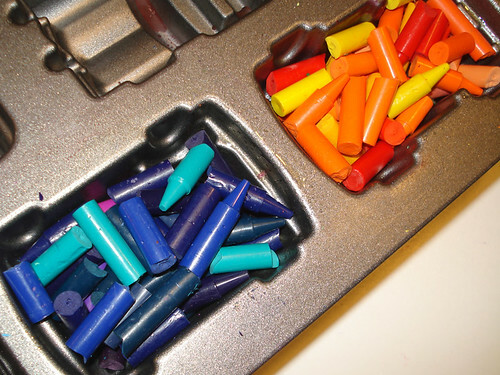 A great way to upcycle used crayons into new fun! I’m going to have to hide this post from my kids if I am going to keep them happy with the crayon hearts we made for Valentine’s Day. Thanks for this great idea. I made them as goodie bag favors for my son’s 2nd birthday party. They were a hit! this is awesome! i am definately trying this!!! My boys and I are making these tonight. Thank you for sharing this! It’s so fun. 🙂 One thing I discovered to cut down on the peeling labels – I used a veggie peeler to “peel” a strip down the crayon so then the labels fall off. Just in case you make more – this saves a lot of time. You are a genius using a veggie peeler! I’ll be getting ours out next time. I was using my thumb nail, but it was getting pretty sore. I love these cars and will be trying them over the xmas break. I just discovered your blog and I LOVE this idea!!! Now I just have to find some cute molds to try it out! Thanks for helping this not-always-so-creative-with-the-kid-projects mom out! I LOVE This!! Just found your blog, and these are great my son will go nuts over them.. We do crafts 3 times a week and i am running out of ideas.. (he is 4 now) This is great to put a new spin on a old crafts. Plus this will be great for his Birthday race car party we will do.. Thank you so much, and i will be looking threw your while site. Thank YOU!! Oh these are so fun! We just did them again last week. The boys really enjoy peeling the paper off of the crayons, plus it’s a great little fine motor activity for little hands. How fun to do crafts with your kids on a regular basis. I often plan to, then run out of time. Enjoy! He loves his CRAFT time and does not let me not have time.. it is my fav part of every week.. The mess and all, there is nothing that can’t be cleaned up or replaced, spending time with my son is worth it every time..
After seeing this i thought I wonder if my microwave candy molds will work too, so i am in the process of trying that now. T will get a great surprise when he gets home if it works out, and he will enjoy coloring with them. thanks again for giving a GREAT IDEA to me today. I also linked this on for FB account with the pic I know my Crafty MOPS moms will be here looking this week.. This is definitely something I am going to try! Thank you! So cute. I bought the train, cars, zoo animals & bugs from nordicware. Ugh … I call the pans an investment in the kitchen. The crayons were only $26 for 500! My 10 year old daughter peeled them all in one night. So cute! We are loving this … it’s addicting and fun to try the bugs and get the wings one color pattern and the body another. We have the cutest snail … green swirly body and pink and purple tail! Enjoy them! They’re lots of fun to make! I love this idea and just made them using a Christmas tree model for all of the younger cousins. I stocked up on crayons at the beginning of the school year when they were $.10 a box. I plan to use it for my daughter’s valentine’s gift too. Keep up those boy crafts! I’ve got three boys 3, 7 and 10 and I’m looking for summer activities. The cars look like great fun, thanks! This is fabulous! Thanks for the tutorial. I’ve friends who will love Lego crayons for the kids. They had an AWESOME toy called Master Caster when I was a kid. 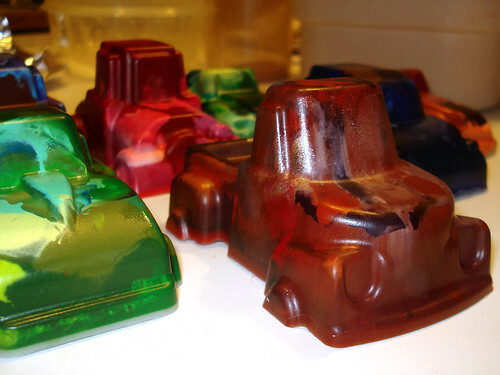 You put wax (or crayons) into a drop shoot, it melted and then your poured into car molds. It came with real Adela and tires so you could make real moving cars. It was one if my very favorite toys! Just looked up the Master Caster and I must say it looks very cool! Adding wheels would be a definite plus! They should bring it back. So cute. I can see my son and my neice loving making these. I might try them out and share the result on my blog if you don’t mind? Of course, please share them on your blog. I’d love to see them!